China came to the Shangri-La Dialogue to both romance and rumble. The language of regional romance jars mightily with the grouchy belligerence over the South China Sea. The rich suitor came wooing with honey words, then broke the spell by banging on the table. The China duality was on display in the presentation by Admiral Sun Jianguo, deputy chief of the People’s Liberation Army. In its 15th year, the Asia Security Summit has some theatrical traditions. The call and response—attack and counter-attack—between the US and China is kabuki-like ritual. Then on Sunday, the head of the China delegation gets to do a plenary push-back. Carter’s speech was all about China all the way through. Admiral Sun’s  was a fine expression of the China duality. The first half was sunshine and romance. The second half was all rumble (rumble definition: a fight between thugs). China does the romance language so constantly, the words take on ritual quality. Yet the words do matter; more than statement of good intent, they can be measured against performance. Asia–Pacific countries, the Admiral said, constitute a community of shared destiny, interdependent and inseparable: ‘The bright future for the Asia–Pacific region has to be facilitated by common development and common security of all regional countries’. China advocates a new outlook which is ‘inclusive, shared and win-win security cooperation by all’. The jab from Carter that hurt was the line about erecting a Great Wall of self-isolation. The standard Chinese line is that the US is a captive of Cold War zero-sum thinking while China is the champion of a new future—Asia run for and by Asians. In that view of the world, the US does zero while China does win-win; the sardonic translation of win-win is that China wins all the time. With the international tribunal in The Hague about to announce its decision on Manila’s case against China in the South China Sea, Beijing keeps digging in deeper with every statement. The Great Wall of denial builds. Sun repeated that the tribunal has no jurisdiction over China and the judgement will be ignored. So when the tribunal makes a binding decision (under the UNCLOS that China has ratified) China will announce it doesn’t matter and won’t be accepted. For China, a reputational disaster looms. China, the law-abiding citizen, will flout the court. Sun ran the standard line that everybody else caused the problem—the Philippines is berated for daring to go to court and the US is provocative for sailing and flying through the South China Sea. 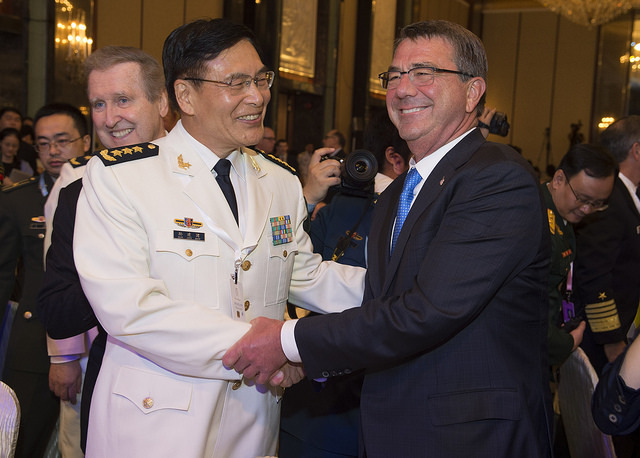 Admiral Sun said the South China Sea remained stable and freedom of navigation hadn’t been affected. China always insisted on peaceful settlement of disputes through negotiations and consultations. Those negotiations, of course, should be bilateral and win-win (refer to the sardonic interpretation). Nicely put. Pity about that hand banging the table.